Via Marc over at Amsterdamize I got wind of a Bike-in Movie series hosted by the San Francisco Bicycle Coaltion. You can read about it here - it sounds brilliant. Upon reading the article I remembered two things, two memories, that I had completely forgotten all about. The writer of the piece saw the film 'Rad' last month. It hardly registered on the cinema radar, this BMX film by Hal Needham. Memory #1: At that time of my life we were living in Calgary, Canada. Okay, that's not the memory I'd forgotten, although I sometimes wish I had... :-) But it came back to me that I actually auditioned for a role in that film. I remember the cheap and cheesy casting room and the lame lines I had to read from the script. Didn't get the gig, although my mate Jamie Clarke did get a role, which was wild. 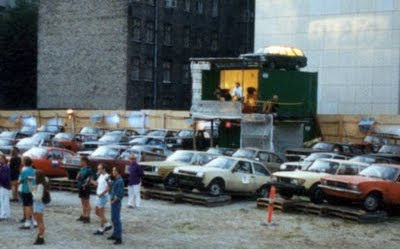 Memory #2 was of a kind of drive-in film set-up in Copenhagen, back in 1994. There was an empty lot in the Nansensgade quarter and that summer there was a Skrot-In Film series. 'Skrot' being the Danish for 'wreck' or 'scrap'. The photo is from the event back in the day. In a city with only 40% car ownership, drive-in cinemas were something they did in the provinces and in American films. When you have bicycle infrastructure and good public transport, you simply don't need a car. So a whole bunch of cars were borrowed from the scrap heap and placed on this empty lot and, not surprisingly, most people showed up on bicycle or on foot. You paid for a ticket and then found a car you liked and hopped in. If you were four people, you could get your own car. Otherwise you'd share, which I recall we did, sitting on the front seat and another couple on the back seat. A screen was hung up on the side of a building and the front wheels of all the cars were raised up on pallets to give a better view. Waitresses came around serving beer and, before the film, a theatre group performed an 'interpretation' of the film showing that evening. It was lame, I recall. We saw Greenaway's The Cook, The Thief, His Wife and Her Lover in that crappy old car on that balmy summer night. And that wasn't lame. It's times like this that you think, "christ, the internet is cool." I found a page about the Skrot-In Cinema, complete with photos, on the Cinema Museum's website. I didn't realise it was all the way back in 1994 but now I know and I even have the dates. Now all I need to remember is who the hell I was with. Female, certainly. But I can't for the life of me remember. What a crappy film, but when it's part of a memory regained, it's nice.